We recently had the opportunity to create a relaxing Master Suite for one of our favourite clients ( yep we have favourites .... if parents can have a favourite child, we can have favourite clients). Her only request was "bright, airy and calm". 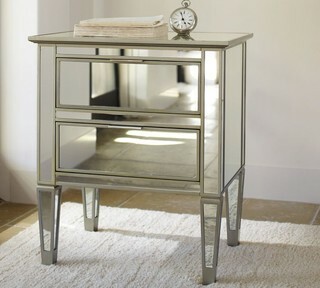 She was elated with the finished product; so we must pay homage to these awesome side tables that stole the show.. These beauties were pretty difficult to find, but we searched high and low and landed them at one of our favourite little spots in Kingston, Jamaica ( www.livingspacesjm.com) . When you visit, just tell them we sent you. There was no better way to complement the calming mint walls and soothing greys, than a pair of glamorous night stands. The mirrors help to bounce light around the room, creating a more spacious feeling, and also reflect the soft glow from the lamps during the night. The quatrefoil patterned area rug appears to continue endlessly in the table's reflection, adding dimension to the space. While the night stands don't scream at you, they add a touch of elegance to any room and are impossible to ignore. Every girl needs even a tiny bit of glitz and glam in her bedroom (to satisfy our inner princess); and these mirrored bedside tables are the perfect fit.